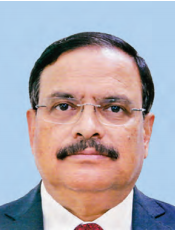 India will begin implementing the Paris Agreement in 2021, says Secretary of Ministry of Environment, Forest & Climate Change CK Mishra in an interview with Biz@India. Mishra also talks about India’s agenda at COP24. Three years after the Paris agreement, as India prepares for the Katowice meeting, what are the main issues that you would like discussed at Cop24? COP24 is an important milestone in our work under the United Nations Framework Convention on Climate Change (UNFCCC). The key agenda for COP24 includes the decision on Paris Agreement Work Programme, stocktaking exercise on pre-2020 action and ambition, political phase of ‘Talanoa’ Facilitative Dialogue and a high level event on climate finance. 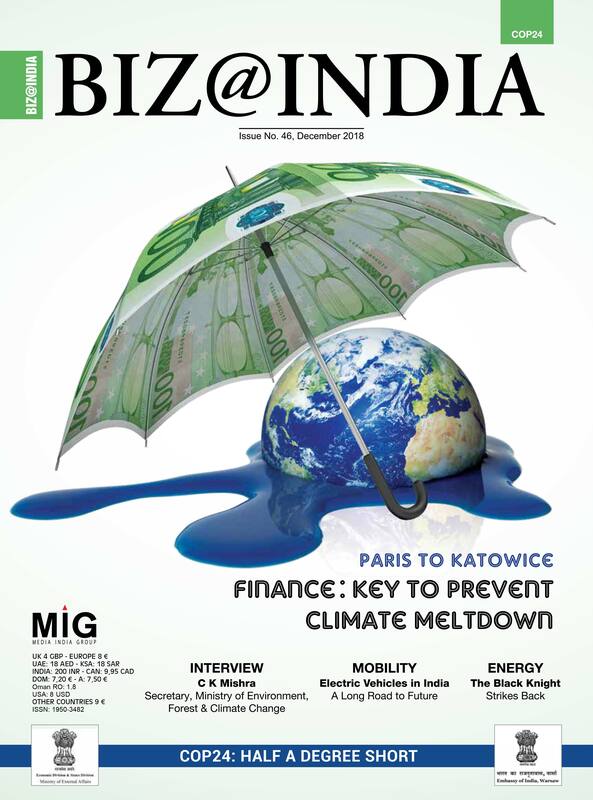 Enhanced Pre-2020 actions by developed countries and mobilising finance in both pre 2020 and post 2020 period remains an overriding concern for India and will be key issues for COP24. We expect COP24 to deliver meaningful outcomes on the agenda of pre-2020 implementation and ambition for a strong foundation for post-2020 implementation period. Finance is one of the critical enablers of climate actions in developing countries. Therefore, we expect developed countries to deliver on their commitment to mobilise USD 100 billion each year by 2020 and further scale it up in post2020 period. A recent report by TERI says that India is likely to miss its target for reduction in carbon emissions by 2030. Your response? The 2030 target will be implemented between 2021- 2030. We are on course to achieve our pre-2020 target and have already reduced the emission intensity of GDP by over 20 pc between 2005 and 2014. TERI is an independent organisation and the ministry is not aware of the basis of the reports published by them. India’s NDCs are synchronised with its development goals and simultaneously reflect its bold vision for combatting climate change. Government of India is confident of achieving its goals submitted as part of its first Nationally Determined Contributions under Paris Agreement. What has India done since Paris meet to promote sustainable development and fight climate change? As I have mentioned earlier, the implementation of the Paris Agreement will begin in 2021. However, a slew of measures have already been initiated under the vision and guidance our Prime Minister. We are implementing one of the largest renewable energy expansion programmes with the target to achieve 175 gigawatt (GW) renewable energy capacity by 2022 and we have already achieved more than 71 GW. The government is also implementing programmes for a clean India, as well as to provide clean cooking fuel to the poor and also distribution of LED bulbs for householda. We are also investing in smart cities, green and sustainable transport system, electric vehicles, climate friendly agricultural practices, afforestation, better irrigation, and water conservation measures and so on. The government has also launched various awareness programmes to connect with the citizens in the country and encourage them to adopt green practices and make their contribution count in our efforts to combat climate change. The rule book for monitoring the NDCs has not been agreed upon even now. Isn’t this likely to severely undermine the Paris Agreement and its credibility ? Nearly 180 countries have already submitted NDCs that they plan to implement post 2020; therefore, the implementation will begin in right earnest after 2021. Paris Agreement and its accompanying decision already provide the essential building blocks for its implementation in post-2020 period. The guidance being developed now will only apply to the next set of NDC. We expect that the outcome of COP24 would address these issues. The developed world once again seems keen to avoid putting the money on the table as agreed in Paris to contribute an additional USD 100 billion each year to assist developing nations in adopting climate friendly technologies. What will India do about this? Finance is one of the critical enablers of climate actions in developing countries. While we are doing our bit, our strong commitment must be met by the leadership that the developed countries are supposed to provide in taking actions regarding mitigation and providing means of implementation in terms of finance, technologies, and capacity building. We therefore expect developed countries to fulfill their climate finance commitments of mobilising USD 100 billion per annum by 2020 and further scale it up in post-2020 period. Is access to technology easier today than it was during the ozone action plan? Technology innovation is one of the powerful solutions for countries like India to simultaneously address climate change concerns and its development needs. Although in the recent years, there has been progress on collaborative R&D and innovation, challenges still exist in accessing technology due to high investment costs and intellectual property issues. How has India reacted to the US President Trump’s decision to pull out of Paris agreement? The decision of the US to withdraw from Paris Agreement is part of their domestic agenda. However, as the US is one of the largest contributors to the cumulative historical emission, its withdrawal may affect goal of restricting cumulative global greenhouse gas (GHG) emissions. It may also affect the availability of international funds for climate change, as it was a contributor to climate finance. India remains committed towards climate action. India’s climate actions stem from its traditional ethos and commitments to preserve the environment for the current and future generations. The concerns for the global ‘commons’ has been in the forefront of government’s developmental efforts including thrust on renewable energy, smart cities, sustainable transport, climate adoptive agricultural practices, better irrigation, water conservation measures, and so on. What would be the fate of Katowice meeting? Do you see a meaningful outcome or a papering over of deep differences, as it happened in Paris? India looks forward to engage constructively and positively to work together with all Parties in an open, transparent and inclusive and manner to achieve a balanced and comprehensive outcome at COP24. How are you combatting the severe air pollution in the Indian capital and other cities? We have developed a Comprehensive Action Plan for Air Pollution Control in Delhi & National Capital Region. It includes concrete action points including setting up of more real time monitoring stations, NCR-wide air quality monitoring expansion, research studies including air pollution inventory, source apportionment, health impact studies and exposure impacts as well as ensuring implementation of BS VI fuel and emission rules. At the national level, we have formulated National Clean Air Programme (NCAP) as a medium-term strategy to tackle the increasing air pollution problem in a comprehensive manner. The objective is to augment and evolve effective ambient air quality monitoring networks across the country besides ensuring comprehensive management plans for prevention, control and abatement of air pollution. We are also evaluating the technologies to counter air pollution. How do you assess the menace of growing waste – industrial and domestic? We have revised waste management rules to make them more effective, efficient and stringent. Successful implementation of these rules will help managing waste in a sustainable manner. Swacchh Bharat Abhiyan (Clean India Mission) is one of the most significant cleanliness campaigns to make India clean and litter free. Will Cop24 see a united front by developing nations? What is India’s role? The developing countries have been standing together on all key issues and present a unified front through the group of G77 and China. India has been working positively with all developing countries partners through groups including G77 and China, group of BASIC and Like Minded Developing Countries to present a strong unified position at COP24. India recently hosted coordination meetings of LMDC group and a Ministerial meeting of BASIC groups in the run up to COP24 to further come to a common understanding and coordinated positions on key issues. What has been the progress on International Solar Alliance and do you see problems with solar energy generation in India as numerous auctions have failed to draw any interest? The International Solar Alliance, launched jointly by Prime Minister of India and President of France in 2015, has entered into force as a treaty-based international inter-governmental organisation. A total of 71 countries have signed the ISA framework agreement with 48 countries ratifying it so far. The government of India has set up a target of 100 GW of solar energy installed capacity by 2022 and we have already achieved about 23 GW out of the target.